"Who Sampled It Better?" #9 - Funkadelic's "(Not Just) Knee Deep"
As an aficionado of sampling I had avoided anything from Parliament-Funkadelic until now, not from a lack of affection but from an abundance of OVER-AFFECTION. Long before limited edition records were even a thing, I sought out and bought a live in concert P-Funk double album in my youth, then actually SAW P-Funk live in concert in college. 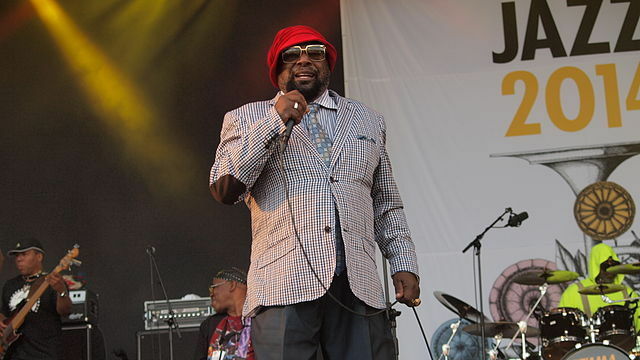 George Clinton's army of awesome has been sampled in hip-hop as much or more as any artists in history, and often with Clinton's encouragement/approval to do so. Of course it wasn't free, the man still got PAID, but he didn't view hip-hop artists as the enemy. Many soul singers, jazz band leaders and rock artists seemed to find it insulting that rap artists would chop up their "great artistic works" and make something new out of it. Clinton not only encouraged the practice but reverses the trend and sought out rappers to work with HIM, resulting in classic songs like "Paint the White House Black." I could sit here and wax poetic about the greatness of Mr. Clinton all day long but we've got some voting to do. Narrowing down the list to just four songs who sampled Funkadelic's "(Not Just) Knee Deep" was a difficult task. At last count no less than 160 artists looped some part of this 1979 track, and when you combine "Part I" and "Part II" it's over 15 minutes long which makes it easy for the samples to be completely independent of one another and sound nothing alike! Nevertheless I've narrowed it down to four songs I think are highly representative of the P-Funk that Clinton and friends bring on the track while simultaneously acknowledging this song IS so deep that we're going to have to do another vote in the future. Let's start with the original song to warm you up. And now for your four contenders - De La Soul, Digital Underground, Snoop Dogg and X-Clan! 1.) De La Soul - "Me Myself & I"
2.) Digital Underground - "Kiss You Back"
3.) Snoop Dogg - "What's My Name?" 4.) X-Clan - "Funkin' Lesson"